An unmanned aerial vehicle searches wreckage for survivors in Pearlington, Miss., following Hurricane Katrina. The vehicle was operated by the Safety Security Rescue Research Center, one of the U.S. National Science Foundation's Industry-University Cooperative Research Centers. Robin Murphy directs the Center for Robot-Assisted Search and Rescue at Texas A&M University. She contributed this article to Space.com's Expert Voices: Op-Ed & Insights. Hurricane Katrina saw the first deployment of drones in a disaster, setting the stage for such drone deployments worldwide — from the Fukushima Daiichi nuclear accident to the Nepal earthquake. The hurricane was a landmark for drone technologies, pivotal in their development for emergencies. Katrina also contributed to policy changes that affect how drones deploy in disasters: Military equipment is now easier to deploy — but when the U.S. Federal Aviation Administration (FAA) "clarified" the certificate of authorization requirement for drones in 2006, they created restrictions for civilian flights that remain controversial to this day. The last decade has seen an evolution in small unmanned aerial vehicles (or UAVs, the preferred name agencies use for civilian, as opposed to military, drones). This is especially true for rotorcraft, which have gone from miniature helicopters to multirotor systems that are less mechanically complex, easier to control and more compact than the radio-controlled helicopters that explored the aftermath of Katrina. Even bigger, but less visible, are changes to software and user interfaces, particularly for controlling UAVs, image quality. And, software now turns images into maps that are more accurate than satellite imagery and 3D reconstructions, letting responders see a disaster from any angle, like in a video game. What hasn't changed is that federal, state and local urban search-and-rescue teams still don't own UAVs or routinely use them — nor do they have clear procedures for deployment. The Center for Robot-Assisted Search and Rescue (CRASAR), as part of the Florida State Emergency Response Team assisting Mississippi — and, later, during Katrina assisting L3 Communications as part of aid to the New Orleans region — deployed small unmanned aerial systems to the areas affected by Hurricane Katrina. CRASAR provided an AeroVironment Raven fixed-wing vehicle, loaned by WinTec Arrowmaker with permission from the U.S. Special Operations Command, and a customized T-Rex miniature helicopter from Like90. Two days after Katrina made landfall, CRASAR remotely flew the vehicles in Pearlington, Mississippi. The town had been cut off; all the roads were blocked with fallen trees, and the phone lines were wiped out. The mission: Determine whether people were stranded and in immediate distress and if the cresting Pearl River was posing an immediate threat. Fortunately, the answer was "no" — in both cases. The UAV video feed showed that, while the area was heavily damaged, the flooding was subsiding and people were working on clearing out the trees and damage. A day later, CRASAR flew a third mission at Bay St. Louis to document the US-90 bridge damage and demonstrate UAV capabilities, and in November CRASAR returned with an iSENSYS IP-3 miniature helicopter, specifically designed for inspecting structures. The iSENSYS IP-3 flew 32 flights successfully and examined structural damage at seven multistory commercial buildings. The rotorcraft was able to provide views of the buildings from angles that were impossible to get from the ground or flyovers. The results not only helped engineers see that the storm's wind damage was much less than expected but also led to a set of studies that would guide safe crew-organization practices used by responders in the United States, Europe and at the site of the Fukushima Daiichi nuclear accident. The Katrina flights also showed structural inspection was not simply a matter of taking photographs. Structural specialists who viewed uploaded images had trouble comprehending the state of damage. Addressing such problems in "remote perception" remains a major open research question. Safety Security Rescue Research Center team members Mike Lotre, John Dugan and Robin Murphy monitor the UAVs during their deployment in Pearlington, Miss. The center is one of the U.S. NSF Industry-University Cooperative Research Centers. Since Katrina, UAVs have been used worldwide for disasters for two reasons. First, they provide better vantage points and higher-resolution images than satellites or manned planes and helicopters. And second, they deploy faster, and responders can control them tactically. Unlike a manned helicopter or National Guard Predator that has to fly in from an airport or base, tactical teams can carry a UAV into a hot zone, deploy it on demand when they see the need and immediately get imagery — a far simpler and faster process than requesting imagery from aircraft controlled and coordinated by a centralized authority and then waiting for those craft to take the imagery and then download the imagery to the team, assuming there is sufficient connectivity. Quantifying success is difficult, similar to measuring the success of a manned helicopter or the value of a camera. UAVs are tools, and their value is in how they help responders. While they are cheaper to use than manned assets — Mesa County, Colorado estimates that its systems cost $25 per hour versus $10,000 to $15,000 per hour for a manned helicopter — cost has not been cited as the primary reason for deploying them at disasters. Instead, responders have cited UAVs' new capabilities. Satellite image of the Fukushima Daiichi power plant three days after the Tohoku earthquake struck. The most visible change since Katrina has been the advent of multirotor craft. Fixed-wing UAVs still look very much like planes, though in newer models, the airframes are often conformable electronic boards providing both the skeleton and the "nervous system" for the vehicle. UAVs are now more likely to carry specialized payloads such as infrared and lidar. Whereas rotorcraft looked like miniature helicopters in 2005, rotorcraft used at recent disasters have been multirotor (with the exception of the Honeywell T-Hawk ducted fan used at Fukushima). The less visible, but equally important and exciting, changes have been in software and user interfaces. As the platforms have matured in the past 10 years, the research and development work has shifted from aeronautics to data science. Data science — or, more specifically, emergency informatics — addresses how responders get the data they need to make decisions about response and recovery. For example, 3D reconstructions of sites are now available through free photogrammetric programs — ones that provide a virtual reality environment — such as Microsoft's ICE or through commercially available packages such as Agisoft and Pix4D. These programs can tile individual photos into a single high-resolution mosaic and then accurately compute the height of the terrain and the size of buildings, as well as estimate the amount of debris that needs to be cleaned up. However, many companies are focusing more on optimizing data gathering for photogrammetrics for agriculture or pipeline inspection, neglecting what responders need and the best way to support them. Some missions, such as flood assessment at the Oso mudslides in Washington state, benefit from UAVs that are optimized for photogrammetrics. Most of these systems are configured to fly preplanned missions and return with the data, with no way for responders to see what the UAV is seeing in real time. But other missions — such as general situation awareness and identification of survivors in distress — are time-critical, and every second counts. Responders still need to see video in real time and actively (but safely) direct robots without first having been trained as expert operators. Robin Murphy and her team from the NSF Safety Security Rescue Research Center used the Like90 unmanned aerial vehicle to investigate buildings damaged by Hurricane Katrina. UAV use at Katrina left an enduring legacy on policy, which has improved overall capabilities in disaster management but may have delayed UAV adoption because of the FAA's reaction. On the positive side, the use of the Raven in Mississippi and the other military UAVs in New Orleans illustrated that the military and its reservoir of technology has a role in domestic disaster response. When Katrina struck, the U.S. Department of Defense had potentially useful UAVs but was uncertain of how to deploy them because of the Posse Comitatus Act of 1878, which essentially says that the U.S. military can't be used on U.S. soil. It doesn't apply to the National Guard, which is run by each state and reports to each state's governor, but there was a fear that public perception would be that anything with camouflage was a violation and fringe groups would see it as the United States trying to curtail individual freedom. Ironically, the Posse Comitatus Act was originally used to get federal troops enforcing Reconstruction after the Civil War out of the South. 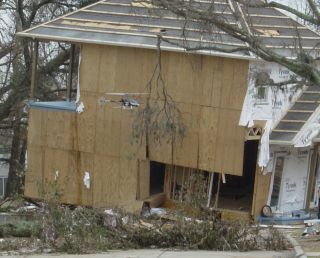 After Katrina, it prevented the South from getting disaster resources. As a result, the Posse Comitatus Insurrection Act was modified in 2006, and later, the U.S. Department of Defense was better integrated into the National Response Framework. The use of UAVs following Katrina also led to the FAA's clarification that small-UAV use required a certificate of authorization (COA) and could not be operated under "hobbyist" rules, creating a barrier to adoption and experimentation. The clarification was due, in part, to alarms raised by the U.S. Coast Guard as to the vulnerability of their tactical helicopter and hoisting operations in New Orleans. Manned helicopters during a disaster typically operate at dangerously low altitudes, and a small bird strike can cause a crash. The presence of any unknown and uncoordinated aircraft puts them at risk for a fatal crash that might kill the very victims the Coast Guard is trying to help. Standard policy, from the early days of aviation, is that when a pilot sees a nearby unknown aircraft, regardless of whether it's manned or a hobbyist toy, the mission is stopped. A rescue flight can't return until an investigation determines it is safe to fly in that area. This means a helicopter pilot would have to immediately stop hoisting a victim from a roof because someone was flying a UAV nearby, regardless of the intent or expertise of the UAV. The problem persists to this day, with UAVs interfering with manned aircraft working at the California wildfires and Texas floods. While there is no report of manned aircraft actually canceling missions at Katrina, the possibility was high enough — and the concern from manned pilots who flew in New Orleans was real enough — that it could not be ignored. The FAA announced the COA requirement six months after Katrina struck. The ruling effectively barred UAVs from disasters in the United States for nearly seven years, when the emergency COA process became more manageable. UAVs have been used in more than 20 disasters worldwide since Katrina, yet in the United States, federal, state and local urban search-and-rescue teams still do not own small UAVs, routinely use UAVs or have clear procedures for deploying UAVs. The technology existed in 2005 and exists in 2015, but then as now, the technology isn't being used. Fire rescue departments don't have grants set aside to purchase UAVs the way the police departments can buy bomb squad robots. Confusion over policies from the FAA and conflicting privacy constraints from federal, state and local interpretations of regulations discourage adoption. A recent FAA ruling allows companies such as Amazon — with the industry version of a COA, called a 333 exemption — to fly with more flexibility than a fire department with a COA. UAVs need regulatory advocacy and government funding to speed the adoption of UAVs for emergency management. Once adoption becomes prevalent, focused research and development will follow, creating a public sector market for UAVs and platforms that are even less expensive and easier to use. Ten years later, Hurricane Katrina is an example of the accelerating urbanization of disasters — increasing populations in urban centers situated along coasts with rising sea levels create significant social and infrastructure vulnerabilities to disasters. Let's hope that 20 years later, Katrina will stand as an example of how new technology was introduced and adopted in emergency management.